Who Makes Better Scrambled Eggs, Bobby Flay or Gordon Ramsay? As far as basic cooking skills go, most of us can scramble an egg. Or at least we think we can. 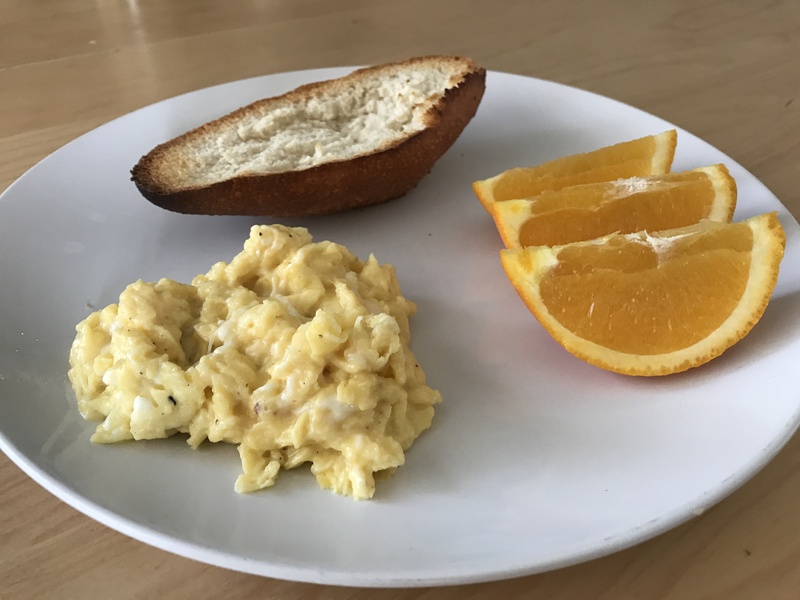 Sure, we can heat it to a point of being safe to eat, but are we really getting the most out of our scramble? Celebrity chefs Bobby Flay and Gordon Ramsay would probably say no. Both of them have explicit directions for creating a heavenly egg, and it doesn’t involve a half-hearted scramble on a stove while scrolling through emails. Their instructions have quite a bit in common. They both expect you to continually scramble your eggs, “you can’t stop stirring. It’s live,” Gordon Ramsay says in his instructions. 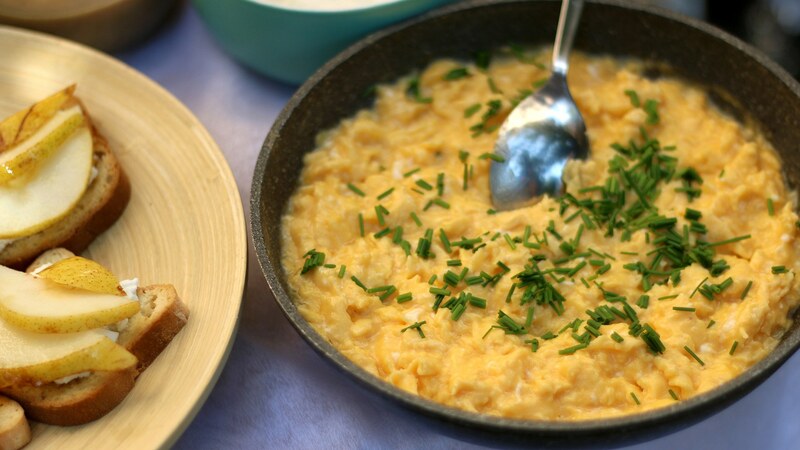 There are only one or two ingredients you wouldn’t necessarily expect for scrambled eggs (as long as you expect scrambled eggs to have eggs, butter, salt and pepper.) One of those is crème fraîche, an ingredient that I couldn’t find in the grocery store so made by combining a half-pint of heavy cream and one tablespoon of cultured buttermilk the night before. In the morning, I had a semi-thick sour cream-like substance (though significantly less salty) and more buttermilk than I will ever know what to do with. The other ingredient is chives, which I didn’t have either, but I figured for the purposes of this test the green onions I did have would be fine. I put both of their recipes to the test to answer the question: Which chef scrambles a better egg? According to PopSugar, Bobby Flay starts his scramble by pre-beating his eggs and adding cold butter and crème fraîche to a pan. 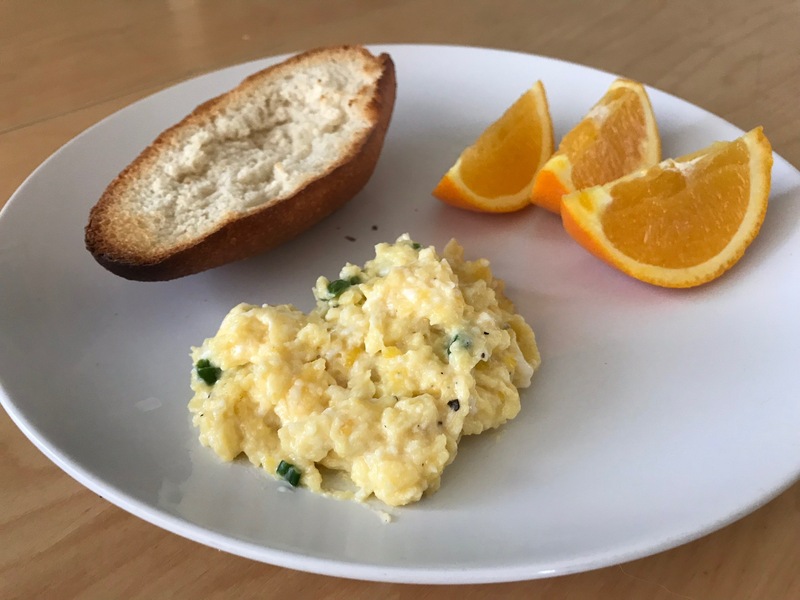 When the butter and crème fraîche are almost (but not quite) melted, he adds the eggs and black pepper and uses a spatula to constantly move the eggs around while they cook. Do not salt them yet. When they’re about three-quarters of the way done, add a bit of salt and plate them. He says they’ll keep cooking. He’s right. They do keep cooking, and they were OK. I’m still getting used to this not-fried-within-an-inch-of-their-life cooking style, but they were fine. The gist of it is this: Do not pre-beat the eggs (shame on you, Bobby Flay). Do not pre-melt the butter, but rather add the whole eggs and a lob of butter to a pan and start vigorously mixing the eggs around with a spatula as they cook (they agree on this part). Ramsay also makes a show of moving the eggs on and off the heat as the eggs thicken, which seemed a little more like a magical egg dance than an actual technique, but I went with it anyway. As the eggs reach their final stages of cooking, he takes the eggs off the heat and adds a dollop of crème fraîche to bring down the egg temperature. He then adds salt and pepper and some chives, which he says lift the flavor of the eggs. These eggs were the bomb. I feel as though they may have had an unfair advantage over Flay’s because of the chives (or in my case, green onions), but hey, Flay didn’t mention chives, and that’s not my fault. The texture was also pretty different — Ramsay’s were sort of velvety and not stuck together, and Flay’s were more traditionally globbed together. So, in this Flay vs. Ramsay challenge, I’d say Ramsay won. Now I have to figure out what to do with half a cup of homemade crème fraîche.